Heat oven to 375°F. Spray 8 (6-oz) glass custard cups with cooking spray. Place on pan with sides. Make macaroni and cheese as directed on box. Stir in squash purée, bacon, cheese and paprika. Separate dough into 8 biscuits. Press each biscuit to form 5 1/2-inch round. Place 1 round in each custard cup, pressing in bottom and up side. Spoon generous 1/3 cup macaroni mixture into each. Bake 20 to 22 minutes or until biscuits are golden brown. Cool 1 minute. Remove from glass cups. 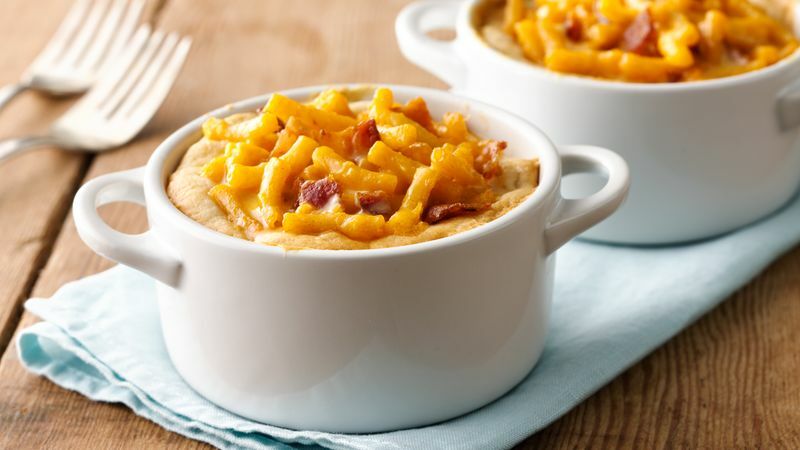 Kids and adults will love these mini pot pies filled with mac and cheese, bacon and smoked paprika.